Police secured a suburb of Brussels during a terror raid that led to three arrests including Paris attack suspect Salah Abdeslam. Armed security officers dragged a man from an apartment in Molenbeek, a suburb of Brussels, after shots were fired in a terror raid related to the November Paris attacks. Belgian police wait in the street of a sealed-off area in the Molenbeek neighborhood of Brussels during an anti-terror operation on March 18 where Paris attack suspect Salah Abdeslam was captured. Belgian security forces seal off an area of the Molenbeek neighborhood. Belgian police stand guard in a street during the police action. A police dog handler holds back curious onlookers during the anti-terror operation. An ambulance escorted by a police car leaves the scene after an anti-terror operation which led to the capture of Paris bombing fugitive, Salah Abdeslam. A police officer guides two women away during the raid. Police evacuate a woman and a small child during the police raid. Police secure the area as they arrive in Molenbeek, a suburb of Brussels. Belgian-born Salah Abdeslam, one of the main suspects from November's Paris attacks was arrested after a shootout with police. Police block a road during the police operation. 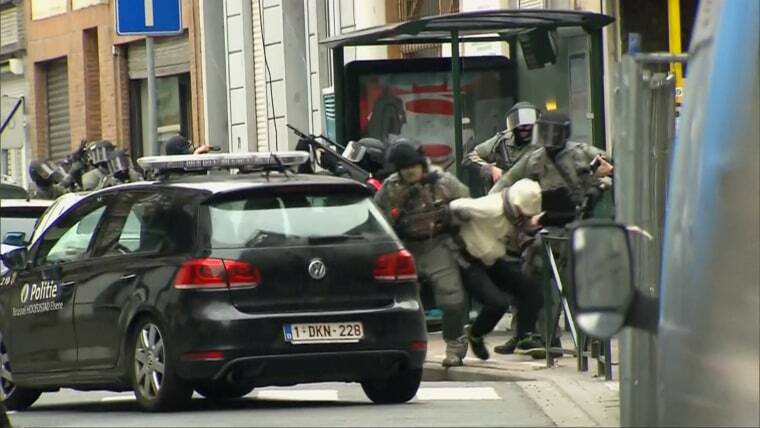 Police secure the scene in the Brussels suburb of Molenbeek.